While the number of inexpensive, efficient compact coupes in the US market is quickly dwindling – the 2013 Kia Forte Koup offers a roomy interior, a low purchase price and excellent fuel economy without taking all of the fun out of the driving experience. There was a point in time where every major automaker in America offered an inexpensive, efficient compact 2-door coupe but many of those models have vanished – leaving the 2013 Kia Forte Koup as one of the few remaining options in the compact coupe market. Ford and General Motors no longer offer a compact coupe and the only compact 2-door model from the Chrysler Group is the subcompact Fiat 500. The tried and true Honda Civic is still available as a 2-door and Hyundai offers the Elantra as a coupe but neither of those models offer the amount of power or the aggressive design of the sporty little Forte Koup. The Scion tC offers very comparable power but with less optional goodies inside and less space for passengers so while the Scion can compete in terms of performance, no vehicle in the segment can compete in both performance and the level of available features. Back in the day, driving an affordable, efficient compact 2-door car meant that you were probably driving some bland, boring econobox but the 2013 Kia Forte Koup is a beautiful example of the fact that you can have the advantages of a compact coupe without suffering the misery of driving the automotive equivalent of tap water. While we have seen the entire compact segment make a shift towards offering a more aggressive exterior design, the Forte Koup is unquestionably the sportiest car in the segment – even compared to performance models like the Honda Civic Si. Across the front end, the 2013 Kia Forte Koup has gloss black cladding around the upper and lower grille openings along with a gloss black mesh used to fill both openings, around the fog light housings and in thick trim areas that run above the fog lights and the lower grille opening. This contrast against the bright red exterior paint of the Forte Koup works with the angular headlights and upper grille opening to provide an aggressive, sporty look while also offering a more upscale look than if the entire front end was just finished in body color. The Forte Koup doesn’t pack high price goodies like projection headlights or LED trim but the basic design does a great job of giving this compact coupe a far more aggressive look than anything with which in competes. Looking at the side profile, the 2013 Forte Koup has a short hood area that quickly meets the aero friendly windshield and roof line. The longer roofline provides for some extra head space for rear riding passengers before the rear glass quickly cuts down to the super short trunk lid. The Forte Koup provides great visibility to the driver thanks to the big side windows and clear line of sight through the rear glass while the body lines allow for all of that glass to be there without making the car look like a modern Chevy Chevette. The hard body line that runs from the headlight, down the side of the car to where it meets the wrap around taillights gives the Forte Koup a fast look even when it isn’t moving while the angular lower body lines bolster the sporty design direction. The most enticing feature of the Forte Koup side view is the sporty split spoke rims finished in gun metal grey; an addition that adds to the sporty contrasting color theme of the car. Overall, the “rake” of the car - or the way that is has an angular stance with the rear end sitting higher up than the front end - accentuates the sporty feel. Out back, the 2013 Kia Forte Koup offers some design cues that make it look far more like a performance car than an economy coupe and this begins with the standard integrated lower diffuser. Lots of high end sports cars have the “fins” that run along the bottom of the car to channel the air out more smoothly and, like the Forte Koup, many of those cars have their lower diffuser finished in a contrasting dark shade. The Forte Koup takes a page from the book of supercars with a similar diffuser finished in contrasting black with the subtle dual exhaust setup tucked neatly into the black lower fascia. Above the aggressive rear fascia and diffuser is a set of angular LD taillights that look great and provide plenty of indication for other drivers while the low profile spoiler completes the sporty rear end of the Forte Koup. The exterior design of the 2013 Kia Forte Koup isn’t outrageous but it has a collection of features that come together to make for one great looking, sporty coupe. This car is everything that the 2-door economy coupe of the 1990s and earlier 2000s were not with a design that helps the Forte Koup to stand out from the crowd with a great, aggressive design and the company has achieved this without pricing the car out of the class. The 2-door compact class has been long criticized for a lack of amenities and a lack of interior space but with respect to the rest of the segment – the 2013 Kia Forte Koup fixes both of those problems. When you look at any model in the 2-door compact coupe segment, the basic interior dimensions are fairly similar but when it comes to actual measurements, the 2013 Kia Forte Koup offers a touch more space in nearly every area. At the same time, Kia has managed to create a roomy interior space while maintaining the “cockpit” style layout that adds to the sporty nature of the Forte Koup. Compared to the Scion tC (which is the only model in the class that compares in terms of performance), the Forte Koup has more head room, shoulder room, hip room, and leg room while having an advantage of over 2 cubic feet in total interior space. What those bigger measurements mean for the driver and passenger is a touch more space in every direction and I found that with the passenger seat moved all of the way back and laid flat(ish) against the back seat, there is enough room for me to lay down and stretch my legs a bit. Also, this extra front driver and passenger space allow for the front riders to move the seats forward more to clear up more leg room for rear passengers. Unfortunately, the back seat is a little tight for adult passengers with the front seats set for two six foot tall people but there is still plenty of room for two kids – or lots of back seat cargo space. When there is no concern about clearing up rear passenger room, the Forte Koup packs plenty of room for even very tall drivers and passengers. No longer do you have to sit in a compact coupe with the legs pressed against the dash. Next up, the 2013 Kia Forte Koup debunks the suggestion that an affordable compact coupe can offer tons of interior goodies and it does so in a big way. First off, while cloth seats are standard, the $1,000 leather package adds great looking heated leather black seats with red stitching along with an auto dimming rear view mirror. The leather package also adds this black and red scheme in the leather wrapped steering wheel, on the shifter, on the emergency brake handle and on the padded armrests in the doors. This leather package is something that is not available in some of the other vehicles in the segment (like the Scion tC) and it adds a touch of class that was once unheard of in an economy coupe. The other big additional feature that was equipped in my 2013 Kia Forte Koup test car was the SX Technology Package that adds $1,800 to the price of the car. This includes a big, bright touchscreen navigation system that incorporates the sound system, Sirius satellite radio and SiriusXM Traffic. On top of the touch screen controls and the basic knobs and buttons mounted around the touch screen, the Forte Koup includes buttons on the spokes of the leather wrapped steering wheel to control the stereo, the Bluetooth phone system and the cruise control. While the Forte Koup doesn’t have an option of an expensive, high end (name brand) speaker system, the standard sound system in the Forte sounds great whether it is pumping out the radio, MP3, CD or satellite tunes. The Technology Package also adds auto defrost, auto climate control with ionized air purification and push button start. Finally, the Forte Koup has a fairly standard gauge cluster – which is a stark contrast to many of the fancy pants clusters found in many new cars – but Kia has done a beautiful job of making the simple layout look great. This three pod cluster has a large tachometer on one side, a large fuel gauge on the right and a massive central speedometer with a small information screen along the bottom. The 2013 Kia Forte Koup is proof that a compact 2-door coupe based on an “economy car” can offer lots of space and an incredible amount of content without putting the price through the roof. When you check all of the boxes for the Forte Koup, the price is in the mid $25k range but there is really nothing else that you could ask for that is offered by any other vehicle in the class. The 2013 Kia Forte Koup is powered by a 2.4L 4-cylinder that produces 173 horsepower and 168lb-ft of torque with that power being channeled to the front wheels via a 6-speed Sportmatic automatic transmission. While I would much rather have a manual transmission, this automatic can be manually shifted via the shifter on the console or by using the steering wheel mounted paddle shifters. Paddle shifters are another feature that is more commonly found on much higher end cars but with Kia integrating the paddle shifters into so many of their vehicles so well – it comes as no shock to me that the Forte Koup has this fun feature. The paddles add an extra element of fun as they provide great control of the shift timing during stints of spirited driving. When you are carving through a set of turns, being able to pop through the gears without taking your hands off of the steering wheel makes the experience much more fun. I think that every car with an automatic transmission should have paddle shifters and I love that Kia has made them standard on their non-manual Koups. While the automatic transmission might allow the Forte Koup to put a little less power to the ground, the available output still makes this sporty Kia coupe a ton of fun to drive. Acceleration is strong (strong enough to chirp the tires a bit in the right situations) with quick, precise shifts bolstering the sporty feel of the Forte Koup. Having spent a fair amount of time in the slightly more powerful Scion tC, I thought that the “seat of the pants dyno” put the two cars pretty much even in terms of acceleration throughout the power band. The Forte moves quickly through the RPMs and pops through the gears as it climbs to 60 from a stop and when you are on the open road with no one around – the Koup will happily tickle the triple digits. The odds are good that most of the people who are buying the 2013 Kia Forte Koup arent expecting to rule the dragstrip so when it comes to “fun to drive” factor, it is all about handling. Luckily, the Forte Koup is fitted with a suspension and braking system that makes this compact coupe a blast to drive whether you are soaring along the highway or blasting through the tight turns of a desolate country road. In a segment where we once had cars like the Dodge Shadow that handled similarly to a half ton pickup, the Forte Koup truly handles like a sporty model. As it the case with many front wheel drive sport models, there is a touch of understeer under hard, high speed cornering but the average driver will find the Forte Koup to answer all of their handling needs. Best of all, the Koup offers tight, sporty handling without destroying the ride quality. While the stiff suspension does transfer some of the imperfections in the Detroit roads through the steering column and the chassis, the Forte Koup offers a ride quality that makes this a comfortable car for a long drive in addition to packing driving excitement for a dash across town. Finally, the 2013 Kia Forte Koup received an EPA fuel economy estimate of 23mpg in the city, 31 on the highway and a combined figure of 26mpg. In my experiences, I found that getting better than 30 miles per gallon on a long highway drive was very doable provided that you arent trying to cruise at 80 miles per hour. When driving with respect to the speed limit, I was able to hit the average fuel economy figure of 26mpg (actually getting 26.2mpg) while driving the car a little harder did drop my per-tank MPGs down to the high 24 range. There was a point in time where buying a 2-door “economy” coupe meant that there was no fun to be had behind the wheel but with a sporty suspension system, a powerful yet efficient engine and an engine that makes it one of the most powerful cars in the class – the Kia Forte Koup doesn’t make you compromise to get great MPGs, great handling or lots of power. The compact class is jam packed full of excellent vehicles but with the majority of those vehicles being 4-door sedans, the 2013 Kia Forte Koup has far fewer competitors than does the Forte sedan. The fact that there isnt a bunch of other 2-door coupes competing with the Forte Koup makes things easier for the sporty little Kia but that doesn’t make the car any less impressive. 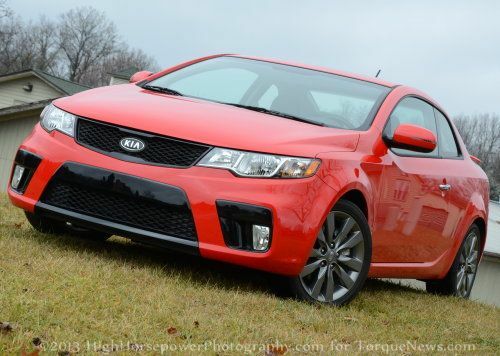 When Kia designed the Forte Koup, they knew that it would be competing with the likes of the Honda Civic so they put together a great looking, aggressive exterior, a roomy interior packed full of high tech features and a drivetrain that provides tons of fun to drive factor without compromising fuel economy. Even when equipped with the paddle shifted 6-speed automatic transmission, the Forte Koup is a ton of fun to drive whether you are carving through the canyons or just cruising down the highway, rocking out to the premium sound system. Best of all, the Kia Forte Koup comes with the company’s standard 5 year, 100,000 mile warranty that you wont get from the competition. If you are in the market for a compact 2-door coupe that won’t break the bank at the dealership or at the gas pump that still offers plenty of driving excitement – the 2013 Kia Forte Koup would be my first choice. The Forte Koup is a beautiful examples of how far the Kia brand has come in the past decade as it not only avoids many of the common downfalls of the compact coupe segment but it does so with a low price and in a better way than any other car in the class today.